For those avoiding certain foods due to an allergy or intolerance, this increases the chance that the body may become mineral deficient. Living with dietary restrictions requires avoidance of certain foods to stay safe and healthy. There is no question that avoiding allergic foods such as nuts, dairy, eggs, wheat, fish and shellfish can be safe and in fact life saving. It can also have detrimental effects on our body over time because the daily nutritional requirements are not met. Good nutrition is the foundation of good health, assisting our bodies to fight disease and sickness.Many people take a multi vitamin to combat these effects, however, few people realise the importance of their daily mineral requirements. Even for those without allergies or dietary restrictions and eat a healthy organic diet, they still aren’t able to access all the nutrients the body requires. 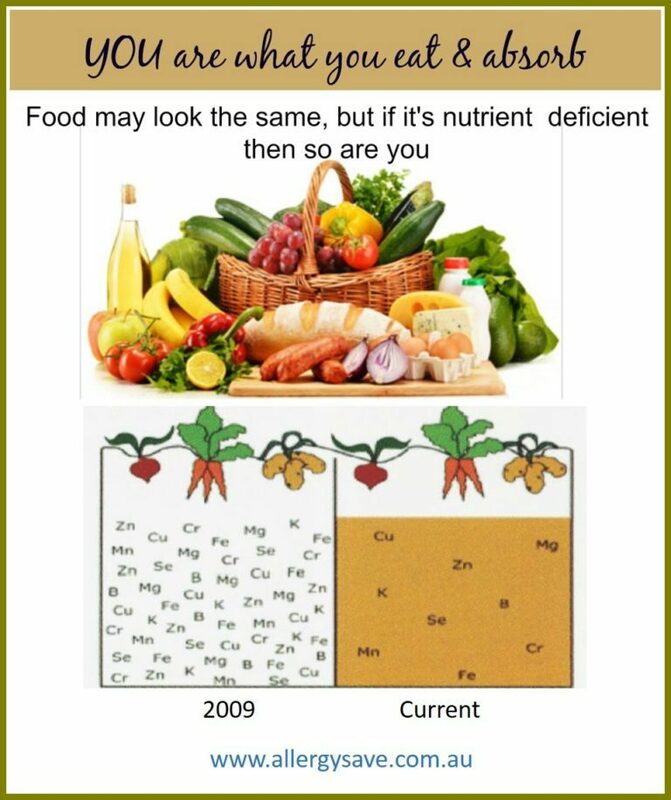 How much more does people with dietary restrictions need minerals? As early as 1936 the US senate declared “99% of US people are deficient in minerals and a marked deficiency in any of the more important minerals actually results in disease”. This is quite possibly similar to Australian statistics. There is no digestive or metabolic process in the body that can take place without minerals. It’s been proven scientifically that the major cause of most of our debilitating diseases and birth defects are caused by mineral deficiencies. None of the functions of the body can occur properly without ALL the minerals present in the diet. Zinc, for example is a common mineral that people are unknowingly deficient in. Symptoms can include: an increased salty/sweet food craving, diarrhoea, low energy, chronic fatigue, poor immunity, bad memory, low libido, infertility, ADD systems, slow wound healing, and nerve dysfunction. It’s important to understand the value of minerals and trace elements and the vital role they play in keeping our bodies healthy. Unsafe farming practices have led to mineral depleted soils used to grow our food. Not only this but the soils are often loaded with toxic chemicals from herbicides and fertilisers. Unless you are eating a totally organic diet, you are ingesting the toxic chemicals infiltrated into our ecosystem. Meaning that even if we do eat a diet rich in fruits and vegetables, your body may not be getting the required minerals needed to eliminate toxic chemicals from your body. Further weakening your immune system and overall health making us vulnerable to many illnesses. Holistic supplementation enables your body the potential for optimum health for now and well into the future. 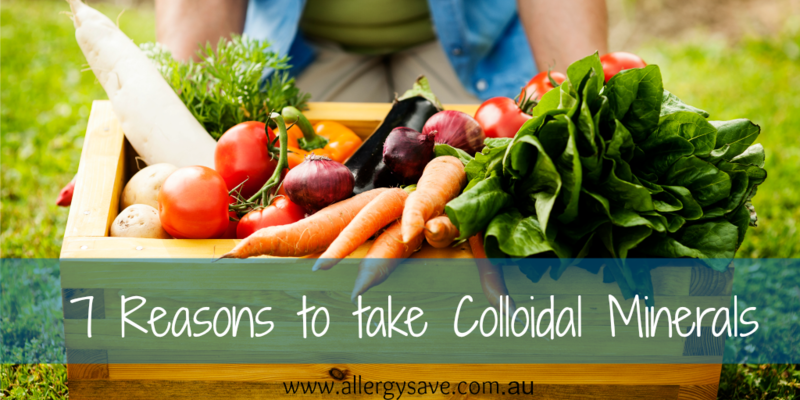 Colloidal minerals are an effective way to get these essential minerals and trace elements into your body. The particles are so small they are suspended in water. This makes them easier for our body to absorb them into our blood stream where they can be utilised more efficiently. Colloidal minerals interact with the chemical structure of your body enhancing the supply of minerals for important body functions. There are a range of colloidal minerals on the market, some better than others. Like with anything else, ensure you do your research so that you know what ingredients they contain. I’ve been using this one for the past 6 years. I feel the difference when I’m taking it – I sleep better, have more energy, my skin improves and I feel healthy. Perhaps just as importantly is that I can tell the difference when I’m not taking it – my skin breaks out, I lack energy, I get the 3pm lethargy and I don’t sleep as well. Educating kids about their own health is key. Some people say I’m ‘lucky’ that I don’t have fussy eaters. Maybe I am, but I think a huge part of that is explaining to them why they need to eat healthy food. I’ve taught them what each food does for their body. We grow much of our own food so they help in the process of paddock to plate. The same with the colloidal minerals. I explained to my kids why we need to take a special mineral drink each day. With my son allergic to so many foods, I was concerned that he would become nutrient deficient. Even though he is on a healthy diet, I wanted to ensure he was getting maximum nutrition. My little man was eager to try it, after first knowing it was safe for him(allergies to nuts, wheat,dairy, eggs, soy, fish and shellfish ). He loves it, he calls it the’ dirt drink’ because its black in colour. If I ever forget, he reminds me that he has to have his dirt drink. My daughter was a bit sceptical at first because of its colour. I was a bit of a deceptive mum for a week as I hid it in her smoothie. One morning she said she’d try some too and was suprised when I told her she’d been drinking it for a week without knowing. She has no issues now as you can’t taste it and she knows how good it is for her. The Natural Mineral Drink that I use and give to my family is from the Neydharting Moor in Austria. Scientists believe that the secret of the remarkable properties of the Moor, lie in the unique geology of the area, and the hundreds of herbs the moor contains. The Neydharting Moor covers 150 acres and is located below groundwater level in a remote valley in Austria. It is encased by non-porous, glacial rock. The Moor Biomass is the result of a complex biological process, acting on hundreds of varieties of flora that have accumulated in the waters of the Neydharting Moor. Hundreds of varieties of herbs that flourish along the Austrian alpine lakes are washed into the moor at the end of their lifecycle. Over millions of years an abundance of minerals have also deposited onto the lake floor. These integrate with the herbs to form the ‘Alpine Moor Biomass’ found in the colloidal mineral drink. Among other constituents, it typically contains the following trace minerals and elements: barium bismuth, boron, calcium, chromium, cobalt, copper, germanium, gold, iron, magnesium, molybdenum, nickel, phosphorus, potassium, rubidium, selenium, sodium, silicon, silver, tin, titanium, vanadium and zinc. Although the body can manufacture a few vitamins, it cannot manufacture minerals or trace minerals. Natural Mineral Drink contains over 80 minerals and trace elements that are highly bioavailable. Natural Mineral Drink contains naturally occurring fulvic acid (helps detox the body from heavy metals). It’s plant derived phytominerals, not elemental minerals, which the body has trouble absorbing. Furthermore, it’s registered as a food, therefore it cannot be regulated, and there is no analysis on the bottle. It’s naturally occurring. There is nothing added but denatured water. The minerals will vary with each batch. For some people, it is best to start slowly with Natural Mineral Drink. For little more than $1 a day, Natural Mineral Drink is one of the best investments you can make for the health of your family. Use Promo Code 921357 for a $10 discount (on purchase over $50). Open a free customer account using the links above and Use Promo Code 921357 for a $10 discount on your order (over $50). Please note that this post contains affiliate links, which helps cover the expenses of running this website so we can continue bringing you free information, support and recipes. We will only ever promote businesses and products that we love and who are in alignment with our own values and goal of supporting allergy families.